Most of the times this should be all what’s needed. First make sure you are using pip version 8.1.0 or newer so you can take advantage of its support for PEP 513 Linux manylinux1 binary Wheel packages. Starting with pymssql version 2.1.3 we provide such wheel packages that bundle a static copy of FreeTDS so no additional dependency download or compilation steps are necessary. 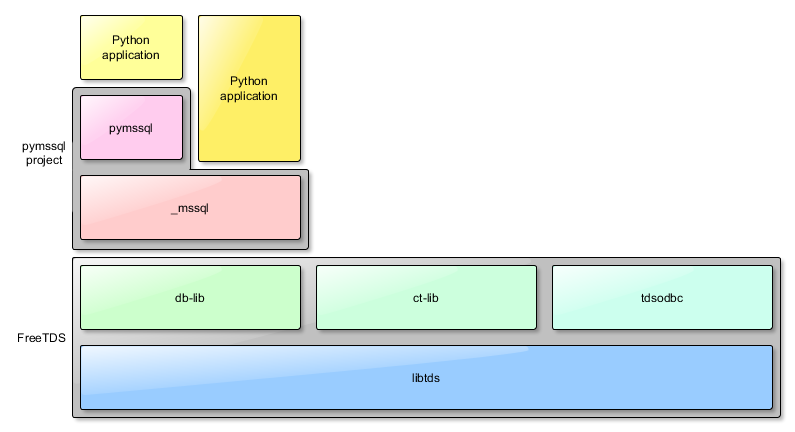 it will fetch the package from the Python Package Index (PyPI) and install it. The statically-linked FreeTDS version bundled with our official pymssql Linux Wheel package doesn’t have SSL support so it can’t be used to connect to Azure. Also it doesn’t have Kerberos support so it can’t be used to perform domain logins to SQL Server. it will fetch the source distribution from the Python Package Index (PyPI), build and install pymssql. First make sure you are using pip version 6.0 or newer so you can take advantage of its support for Windows binary Wheel packages. Starting with pymssql version 2.1.3 we provide such wheel packages that bundle a static copy of FreeTDS so no additional download or compilation steps are necessary. The statically-linked FreeTDS version bundled with our official pymssql Windows Wheel package doesn’t have SSL support so it can’t be used to connect to Azure. See Installation and FreeTDS for more advanced scenarios. Another possible way to get started quickly with pymssql is to use a Docker image. _mssql – use it if you care about performance and ease of use (_mssql module is easier to use than pymssql). And, as of version 2.1.x it uses the services of the db-lib component of FreeTDS. See the relevant FreeTDS documentation for additional details. Python 2.x: 2.7 or newer. Python 3.x: 3.3 or newer. Remember to install FreeTDS first. Discussions and support take place on pymssql mailing list here: http://groups.google.com/group/pymssql, you can participate via web, e-mail or read-only subscribing to the mailing list feeds. This is the best place to get help, please feel free to drop by and ask a question. Current release: 2.x is the branch under current development. It is a complete rewrite using Cython and the latest FreeTDS libraries (which remove many of the limitations of previous versions of FreeTDS). Legacy release: 1.0.3 is the legacy version and is no longer under active development. This documentation is for pymssql 2.x. The document set you are reading describes exclusively the code base of pymssql 2.x and newer. All description of functionality, workarounds, limitations, dependencies, etc. of older revisions has been removed. If you need help for building/using pymssql 1.x please refer to the old Google Code documentation Wiki. Official development repositories and issue trackers have been moved to GitHub at https://github.com/pymssql/pymssql. Help from the community with maintenance of this documentation. If interested, please connect with us on the mailing list.